This article may require copy editing for misuse of external links as references and vice-versa. You can assist by editing it. This article, or parts of it may require copy editing for being written like a news article or catalog instead of a summary. You can assist by editing it. Other than toys, Hasbro produces and licenses an assortment of Friendship is Magic branded products. The franchise's toys and merchandise grossed over one billion US dollars in retail sales in 2014, compared to 650 million USD in retail sales in 2013. The fashion chain Hot Topic started selling FiM-branded shirts in mid-2011, featuring Applejack, Pinkie Pie, and Twilight Sparkle. Other items included hats with the main six ponies and their cutie marks on them, necklaces, socks, and lingerie including hot pants and a bandeau bra depicting Rainbow Dash smiling and looking with half-open eyes at the viewer. The retail chain Asda sells licensed MLP merchandise on its online store and George branch. Zazzle started selling licensed MLP and FiM merchandise in November 2011. 80sTees.com also sells licensed shirts. FashionPlaytes.com started selling licensed shirts on April 3, 2012. TruffleShuffle sells MLP clothing for fans living in Europe and Australia. Online store WeLoveFine.com started selling licensed FiM shirts and accessories in mid-2011.​[​specify​]​ Many of these designs are made by fans and licensed by Hasbro. Multiple calendars have been released. An Advent Calendar is available for purchase in Amazon Germany. It became available slightly prior to the winter 2011 holiday season. A set of six cards featuring the main six ponies is included in the My Little Pony Friendship is Magic Collector's Box. A My Little Pony Digigraph, meant to promote Shout! Factory's DVD My Little Pony Friendship is Magic: Royal Pony Wedding, is available from PonyWedding.com or by text messaging the code ROYAL to 95323. It is personalized with one's name as part of a digital autograph attributed to Princess Cadance and Shining Armor, who appear in the faux-photograph. Collector cards accompany each of the mini-figure toys from all nine waves of mystery packs and the Toys "R" Us exclusive Pony Collection Set, for a total of 228 cards divided into nine sets of 24 and one set of 12. There are four different language versions of the collector card sets (though no one version encompasses all of the sets): English-only versions (of mystery pack waves 1, 3, 4, 5, 6, 7, 8, 9, and the Pony Collection Set), English/French/Spanish versions (of mystery pack waves 4, 5, and 7), English/French/German/Spanish/Portuguese/Italian/Dutch/Swedish/Danish/Greek/Polish/Turkish versions (of mystery pack waves 1, 2, and 3), English/French/German/Spanish/Portuguese/Italian/Dutch/Swedish/Danish/Greek/Polish/Turkish/Russian versions (of mystery pack waves 4, 5, 6, 7, and 8), and Italian-only versions (of mystery pack wave 3 by Gedis Edicola). Enterplay has made My Little Pony Friendship is Magic Trading Card Fun Packs, which were pre-sold at BronyCon on June 30, 2012, released at hobby stores on July 11, 2012, and released at retail stores throughout the U.S. and Canada on July 17, 2012. Shipments to the UK and Australia began in February 2013. Series 1 of the set contains a total of 156 cards: 84 base collectable cards including characters, locations and scenes from the show; 32 foil cards; 12 FunTat tattoos, six of which are cutie marks; and 9 pop-up standees. There are also four foil gold box toppers that come with the booster boxes, a six part Discord puzzle set, and nine additional special foil cards. A promotional foil Rarity card numbered F40 was distributed along with the pre-sale at BronyCon, and other promotional foil cards are being distributed elsewhere. The cards were designed specifically with the brony demographic of older fans in mind, and the writer-consultant for the set has said the consultants submitted "at least a dozen direct fandom nods". Series 2 was released in April 2013, with a pre-release at Big Apple Ponycon on March 23–24. The first series 2 card to be released was a Fluttershy foil, which comes with the Fluttershy collectors' box; another new special card was released at Big Apple Ponycon. Series 2 contains a total of 167 items: 82 common cards, 44 foil cards, 8 gold cards, 9 standees, 9 FunTat tattoos, and 15 stickers (of which six are foil). Several collectors' tins, boxes, and other materials have also been released or announced, each containing a special foil card, a poster, card packs, and other features. Other items are also available from Enterplay's store and other retailers. Enterplay is making a My Little Pony Collectible Card Game, demoed at Gen Con Indy in mid-August 2013 and launching in November of the same year. The game was code-named "Frank", and was hinted at under this name by Enterplay's Facebook page posting an image of Frank Sinatra and asking "What if Frank was a pony!?" in late July 2013. Several coloring books have been published. The front and back covers of two Hasbro-licensed My Little Pony Giant Coloring and Activity Books by Bendon Publishing include Derpy: one book shows her in the window of a cottage in the background, and another book shows Princess Celestia with her cutie mark containing an image of Derpy. A Hasbro-licensed My Little Pony/Transformers Prime Comic Creator Kit manufactured by Buzz Products has been released by Singapore Airlines. The kit's 16-page Comic Creator book includes three MLP comics to finish creating: Friendship Surprise, Boutique Buddies, and Twilight Afternoon. IDW Publishing are publishing Hasbro-licensed full-color comic book series titled My Little Pony: Friendship is Magic, My Little Pony Micro-Series, My Little Pony: Friends Forever, and My Little Pony Animated with editor Bobby Curnow and a host of artists. The comic is done in cooperation with the show's staff and takes place within the show's continuity. Other than the comic book series, several short comic strips appear in different magazines. My Little Pony: The Manga – A Day in the Life of Equestria is a yonkoma manga series licensed by Seven Seas Entertainment. Volume 1 is scheduled to be released in June 2019. A My Little Pony magazine by Signature Publishing is being sold in some European countries. These countries include the United Kingdom and Croatia. In the magazine there is a 8 paged story, posters, general info on the ponies, a cooking recipe, activities, and a free gift with each issue. Issue one of the UK magazine has an eight page story of Friendship is Magic, part 1 and a two page story of The Ticket Master. Issue two has an eight page story of Friendship is Magic, part 2 and a two page story of Applebuck Season. Issue three's main story is Griffon the Brush Off and its short story is Dragonshy. Other issues have Winter Wrap Up and Look Before You Sleep, Bridle Gossip and Suited For Success, and a four page story of Sonic Rainboom and a two page story of The Show Stoppers. Issue ten has Over a Barrel and The Dog and Pony Show. Another issue has Owl's Well That Ends Well and Green Isn't Your Color. The magazine mistakenly names Winona as "Jackaroo", abbreviates zap apples to "Zapples", and completely removes the changeling storyline from A Canterlot Wedding. Sparkle World magazine includes My Little Pony as well as several other series aimed at young girls such as Polly Pocket, Littlest Pet Shop, Rainbow Magic, Puppy in my Pocket, Strawberry Shortcake, Angelina Ballerina: The Next Steps, and Winx Club. Several My Little Pony stories have been printed in this magazine: Rain, Rain Go Away! (four pages, also printed in the Dutch magazine), The Magic of Friendship (two pages), Pinkie Pie's Twitchy Tail! (two pages, based on the episode Feeling Pinkie Keen), Christmas at Canterlot!, Spooky Slumber Party! (four pages), The Hero of Ponyville! (four pages), A Scary Visitor! (two pages), Winter Wonderland! (four pages), Pony Friend of The Year! (four pages), The Great Cake Disaster! (two pages), and Pony Flu! (four pages). There is a Dutch My Little Pony magazine. At least one comic has been printed in this magazine (based on the episode The Ticket Master). At least one story has been printed in this magazine (four pages, a Dutch version of the Sparkle World story Rain, Rain Go Away!). There is a French My Little Pony magazine, published by Panini. At least three stories have been printed in this magazine: Les surprises de l'amitié (five pages, also printed in the German magazine as Das Überraschungsfest), La récolte d'Applejack (eight pages, based on the episode Applebuck Season), and one about the Grand Galloping Gala. There is a German My Little Pony magazine, published by Panini. At least eleven comics have been printed in this magazine: Wundersame Apfelkekse ("Wondrous Apple Cookies"; five pages), one whose title translates to A Big Decision (three pages), one whose title translates to The Secret Mission (three pages), one whose title translates to The Great Search (five pages), one whose title translates to Slip 'n Slide (three pages), one whose title translates to No Way Too Far (five pages), Der Stern der Winterträume ("The Star of Winter Dreams"; five pages), Mach mal Pause! ("Take a Break! "; five pages), Apple Blooms großes Abenteuer ("Apple Bloom's Big Adventure"; five pages), Einfach rufus ("Just rufus" five pages), and one whose title translates to A Bright Idea (five pages). At least eight stories have been printed in this magazine: Ein glänzender Auftritt für Rarity ("A Dazzling Performance for Rarity"two pages), Ein unlösbares Rätsel für Twilight Sparkle ("An Unsolvable Mystery for Twilight Sparkle"; four pages), Eine Freundin hat's nicht leicht ("Being a Friend isn't Easy"; based on the episode The Ticket Master), Das Überraschungsfest ("The Surprise Party"; five pages, also printed in the French magazine as Les surprises de l'amitié), the first part of Die Legende von Nightmare Moon ("The Legend of Nightmare Moon"; five pages, based on the beginning of the episode Friendship is Magic, part 1), the second part of Die Legende von Nightmare Moon and/or one or more other stories based on the episodes Friendship is Magic, part 1 and Friendship is Magic, part 2, Ein komischer Vogel ("A Strange Bird"; four pages, based on the episode A Bird in the Hoof), and Superschwestern fürs Leben ("Super-Sisters for Life"; eight pages, based on the episode Sisterhooves Social). Multiple posters have been printed in this magazine, including a reprint of the Comic Con 2011 promotional poster. There is a Hungarian My Little Pony magazine. At least one story has been printed in this magazine. Multiple posters have been printed in this magazine, including a reprint of the Comic Con 2011 promotional poster. Pucchigumi magazine, published in Japan by Shogakukan, is to include a My Little Pony Friendship is Magic manga. The manga is drawn by Akira Himekawa, and debuted on August 12, 2013. There is a Norwegian My Little Pony magazine, published by Egmont. At least six stories have been printed in this magazine: Kappløp i luften! (four pages), one whose title translates to The Birthday Cake (three pages), Karnevalet (four pages, also printed in the Polish magazine as Bal przebieranców), one whose title translates to Pinkie Pie becomes sick (four pages, also printed in the Polish magazine as Katar Pinkie Pie), Te på slottet til Celestia (four pages), and Regntøy til alle! (four pages). This magazine is also sold in Turkey. There is a Polish My Little Pony magazine. At least five stories have been printed in this magazine: Bal przebieranców (four pages, also printed in the Norwegian magazine as Karnevalet), Katar Pinkie Pie (four pages, also printed in the Norwegian magazine), Spacer nad rzekę (four pages), Przygoda z muszkami (four pages), and Dzielna baletnica (four pages). A limited-edition poster with 5000 printings was sold at San Diego Comic-Con 2011, containing a host of characters from the show, one of whom had not yet debuted. Another poster was also handed out at the convention, this one containing only the main cast and the official logo. A poster of Hasbro's Design a My Little Pony Contest winner Tinker and nine runners-up Super Fan, Sunny Sweet, Sugar Sprinkles, Steel Masquerade, Pineapple Splash, Neon Brights, Farafra, Clever Heart, and Cocoa Steam, captioned with the title "2012 Design a MY LITTLE PONY Finalists". A poster of twenty-one characters from the show, most of whom have also been made as toys. An inspirational poster of Spike, captioned with the word "AMBITION" and the quote "'Spike want!!!!' –Spike" from Secret of My Excess. An inspirational poster of Applejack, captioned with the word "INDEPENDENCE" and the quote "'I harvested the entire Sweet Apple Acres without your help. How do you like them apples?' –Applejack" from Applebuck Season. An inspirational poster of Pinkie Pie, captioned with the word "SPIRIT" and the quote "'I never leave home without my party cannon.' –Pinkie Pie" from Sweet and Elite. An early version of this poster used fanart; the artwork was redrawn for the final version. An inspirational poster of Princess Celestia, captioned with the word "ACHIEVEMENT" and the quote "'We are gathered here today to once again honor the heroism of these six friends who stood up to the villain Discord and saved Equestria from eternal chaos.' –Princess Celestia" from The Return of Harmony Part 2. An inspirational poster of Rainbow Dash, captioned with the word "COURAGE" and the quote "'I could clear this sky in ten seconds flat.' –Rainbow Dash" from Friendship is Magic, part 1. An inspirational poster of Twilight Sparkle, captioned with the word "DETERMINATION" and the quote "'If I can't find a friendship problem, I'll make a friendship problem!' –Twilight Sparkle" from Lesson Zero. An inspirational poster of Rarity, captioned with the word "CONFIDENCE" and the quote "'Nice is an understatement, I look fabulous!' –Rarity" from Dragon Quest. An inspirational poster of Fluttershy, captioned with the word "SUCCESS" and the quote "'Yay!' –Fluttershy" from Sonic Rainboom. Four posters were released on August 3, 2012. One features a map of Equestria, another features a season two cast picture, the third features some antagonists from the show's history, and the final poster features the Royal Wedding party. The "antagonist + monster" poster is the third version designed for the purpose, according to the animator who created it. My Little Pony art prints are available from the online store WeLoveFine.com. Many of the designs printed on its My Little Pony products are made by fans and only licensed by Hasbro. A 256-page My Little Pony Friendship is Magic official guidebook entitled My Little Pony: The Elements of Harmony, written by Brandon T. Snider with a foreword by Lauren Faust and an introduction by Meghan McCarthy and Jayson Thiessen, was published in English by Little, Brown and Company on June 4, 2013, with the respective ISBN-10 and ISBN-13 numbers 0316247545 and 9780316247542 and a list price of $16.99. It includes an updated Equestria map and all episode summaries, friendship lessons, and song lyrics from seasons one through three. Barnes & Noble and Amazon initially listed this book online in September 2012 as a handbook with a lower page count of 144 pages, an earlier publication date of April 2, 2013, and a lower list price of $14.99. Meghan McCarthy contributed behind the scenes info to the book. An electronic and abridged version of the book (omitting the episode guide) was made available on iBooks, Amazon Kindle and Google Play on December 10, 2013. A second volume to this compendium was released on June 6, 2017. My Little Pony: I Love to Draw!, stylized as My Little Pony: I ♥ to Draw!, was published on June 11, 2013, containing 32 pages with stencils and stickers, instructing how to draw the ponies. My Little Pony: Mini Pony Collector's Guide was published on October 1, 2013, containing an "exclusive" mini-figure toy of Tealove, which was previously released in Europe as part of the second wave of mystery packs. The Art of Equestria by Mary Jane Begin is a production-art book about the television show that includes concept art, episode storyboards, and a section about fan culture and fan art. A second 256-page official guidebook entitled My Little Pony: The Elements of Harmony Volume II, written by Brandon T. Snider and Natasha Levinger, was published by on June 6, 2017, bearing ISBN 978-0-316-43197-2. It includes a further-updated map of Equestria and episode summaries, friendship lessons, and song lyrics from seasons four through six. Many Friendship is Magic storybooks have been licensed or published by Hasbro. Some are bundled in printed form with toys, while others are sold individually in print or as e-books for the Amazon Kindle, the Barnes & Noble Nook, Google Play, or iOS. Several of the books recount episodes from the animated series, for example The Ticket Master, Applebuck Season, Dragonshy, and others. Other books add narrative that fits into the animated series, like Twilight Sparkle and the Crystal Heart Spell and Pinkie Pie and the Rockin' Ponypalooza Party!. Friendship is Magic chapter books are published by Little, Brown and Company in print and e-book formats. Each features a different character and has an original story that ties in to the show. German audio drama albums in CD and MP3 formats are being released by Edel Germany GmbH. Volume 1, entitled My Little Pony Freundschaft ist Magie: Ein Auftrag von Prinzessin Celestia, and Volume 2, My Little Pony Freundschaft ist Magie: Apfelschüttelernte, were released on April 6, 2012. Volumes 3 and 4 were released on August 10, 2012. Volumes 5 and 6 were released on November 9, 2012. Volumes 7 and 8 were released on February 15, 2013. Volume 9 and 10 were released on May 17, 2013. Volumes 11 and 12 were released on August 16, 2013. Unabridged audiobook versions of storybooks and novels, starting with Welcome to the Crystal Empire, Ponies Love Pets!, and Meet the Princess of Friendship, started being released on July 12, 2016. At the February 2013 Las Pegasus Unicon panel "The Man Behind the Music: The Career of Daniel Ingram", Daniel Ingram commented on the possibility of a soundtrack. On December 2, 2013, My Little Pony - Songs of Friendship and Magic (Music from the Original TV Series), containing select songs from seasons one and two, was released on iTunes and Google Play. On April 21, 2014, a followup album entitled My Little Pony - Songs of Ponyville (Music from the Original TV Series), containing songs from seasons three and four, was released on iTunes. On September 10, 2014 and September 24, 2014, two albums featuring songs from both Equestria Girls films were released. Friendship is Magic is available for digital download on iTunes in 480p Standard Definition or 720p and 1080p High Definition, with individual episodes retailing at up to $2.99 and whole seasons at $49.99. Three LeapFrog Video Apps containing two episodes each are available in the LeapFrog App Center for LeapPad and Leapster Explorer. Volume 1 contains Dragonshy and Swarm of the Century; Volume 2 contains Friendship is Magic, part 1 and Friendship is Magic, part 2; Volume 3 contains The Show Stoppers and Stare Master. Episodes have been made available on online video streaming service Netflix starting on April 1, 2012. Shout! Factory has released an English Region 1 DVD entitled My Little Pony Friendship is Magic: The Friendship Express on February 28, 2012. However, certain stores released it earlier. The Friendship Express contains the following: Friendship is Magic, part 1; Friendship is Magic, part 2; Over a Barrel; Hearth's Warming Eve; The Last Roundup (original version); an episode of Pound Puppies (2010); a My Little Pony theme song (extended version) karaoke sing-along; six of the eight character profiles (all except Meet Spike the Dragon and Meet Rainbow Dash); a Swarm of the Century coloring page; and three commercials: one for the show on The Hub, one for the G3.5 DVD My Little Pony: Twinkle Wish Adventure, and one for Pound Puppies on The Hub. An English MiniDVD entitled My Little Pony Friendship is Magic: Lesson Zero, containing the eponymous episode, was bundled with select Pony Wedding Playful Ponies toys such as: Cherry Berry, Lyra Heartstrings, Sunny Rays, and Trixie Lulamoon. Region 4 DVD releases of season one began on June 20, 2012 and were released by Madman Entertainment, beginning with volumes 1 and 2, subtitled Friendship Changes Everything and That's What Friends Are For respectively, and a collector's box containing Volume 1 and an exclusive gift. Volumes retail at AU$19.99, while the collector's box retails at AU$29.99. On August 7, 2012, Shout Factory released a second DVD of five episodes entitled Royal Pony Wedding, featuring the episodes A Canterlot Wedding - Part 1, A Canterlot Wedding - Part 2, Sweet and Elite. Hearts and Hooves Day, and The Best Night Ever. The Friendship is Magic franchise extends to several Flash, iOS, and Android video games and software, including interactive books like Twilight Sparkle: Teacher for a Day, and video games like the My Little Pony game for iOS and Android. There are multiple board games. Monopoly, to be released by USAopoly in July 2013, features Rarity, Fluttershy, Rainbow Dash, Twilight Sparkle, Pinkie Pie, and Applejack; each of the six ponies is included as a token. Regnbågsspelet/Regnbuespillet/Sateenkaaripeli, released by Kärnan in 2012, features Twilight Sparkle, Pinkie Pie, Rarity, and Lyra Heartstrings; each of the four ponies is included as a mini-figure toy. Trouble, by MB Games, features Rainbow Dash, Pinkie Pie, Rarity, and Twilight Sparkle; some playing pieces (pegs) are shown flying out on the front of the packaging, which states that "Pieces do not fly out during play." An officially-licensed My Little Pony tabletop role-playing game called "Tails of Equestria" was released sometime in 2016 by British board game company River Horse. Other branded products include: coloring books, pencil cases, notebooks, backpacks, reusable shopping bags, stickers, magnets, beddings, Mylar party balloons, pony-themed tissues, and many more. Novelty toy manufacturer Imperial Toy has licensed the character Pinkie Pie for a series of bubble-blowing toys. Seven have been available, two of which have a Pinkie Pie plastic figurine. Hasbro-licensed translucent Special Edition Crystal Pony keychains of Pinkie Pie, Rainbow Dash, Applejack, and Rarity made by Basic Fun were presented at the February 2011 Toy Fair; Pinkie Pie and Rainbow Dash were released later in the same year, but Applejack and Rarity have not been released. A Pinkie Pie Christmas ornament was sold in various stores for Christmas 2011. Three different Double Twist Pegasus Pony necklaces have been available from Onch Movement, licensed by Hasbro. GetGlue has stickers for season 3, one per episode except for the two parts of The Crystal Empire, which are combined. Mimoco has released MIMOBOT designer USB flash drives, licensed by Hasbro: Twilight Sparkle, Rainbow Dash, and exclusive limited edition Rarity, all three in late February 2013. Ultra PRO has announced a partnership with Enterplay to produce MLP-themed collectible card accessories. World Trade Jewelers announced a partnership with Hasbro to produce jewelry replicating select Hasbro themes, including My Little Pony. In addition, Hot Topic carries a wide variety of lapel pins, many of which feature MLP characters. New Zealand accessory outlet Deadly Ponies announced in July 2017 that they would be releasing My Little Pony handbags and accessories, including merchandise featuring the original pony character Shadow. Hasbro-licensed vinyl figures made by Funko, between the sizes of Playful Ponies and Design-A-Pony toys, are carried by Hot Topic: Rainbow Dash and unnamed Derpy (called Derpy on Funko's website) were released in late 2012, Fluttershy and Dr. Whooves[sic] were released in late February 2013, and Lyra Heartstrings and Pinkie Pie were released in July 2013. Future releases include DJ Pon-3, Octavia Melody, Spitfire, Sweetie Drops, and possibly Trixie, as well as the rest of the main six and something "larger". Funko POP! figures are also to be released in June (Rainbow Dash, Twilight Sparkle, Pinkie Pie, and Fluttershy) and September (Derpy and DJ Pon-3). 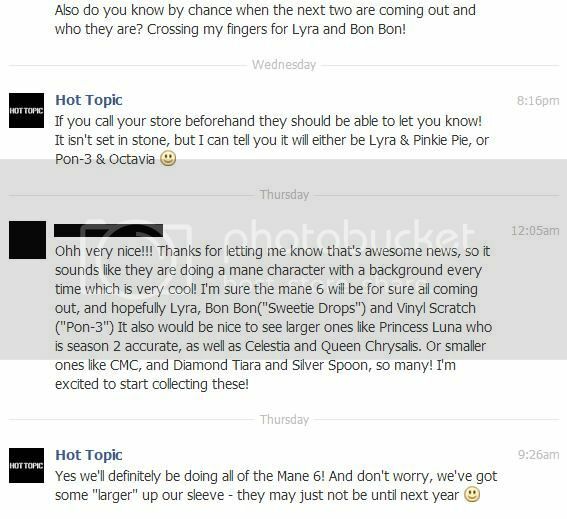 Trixie Lulamoon and Princess Twilight Sparkle were the next My Little Pony vinyls to be revealed and are currently Hot Topic exclusives. As of March 2014, prototypes of Applejack and Big McIntosh were revealed and are now available exclusively at Hot Topic. Daring Do Dazzle, Rarity and Discord were released on August 19, 2014 and made available exclusively at Hot Topic. This gallery is for images of merchandise that do not belong in another category; its sections are linked from the relevant sections on this page. ↑ SilveOptimus (2015-02-13). TFW2005 Coverage Of Hasbro New York Toy Fair 2015 Preview Event. Retrieved on 2015 May 19. ↑ Tony Lisanti (2014-05-01). The Top 150 Global Licensors. Global Licesnse!. Retrieved on 2015 May 19. ↑ Shout Factory Personalized Pony Photo and Tiaras Update. Equestria Daily (2012-07-18). ↑ Enterplay Facebook post "Enterplay Readies MLP FIM British/Aussie Invasion", 2013-02-21. Retrieved 2013-02-23. ↑ 5.0 5.1 Enterplay My Little Pony products. ↑ MLP Trading Cards Sneak Peek #10: Rarity Promo. Equestria Daily (2012-06-30). ↑ Enterplay consultants interview. Equestria Daily (2012-06-27). Retrieved on 2012 July 1. ↑ My Little Pony Friendship is Magic Enterplay Trading Card Series 2 Fun Pack Box. Retrieved on 2013 February 17. ↑ 9.0 9.1 Enterplay Facebook post "Series 2 Preview Card Comes in Sweet FS Box! ", 2013-02-18. Retrieved 2013-02-23. ↑ Trading Card Fun Packs - Series 2 Collector's List (PDF). Retrieved on 2013 April 21. ↑ MyLittlePony: The My Little Pony collectible .... Twitter (2013-08-03). Retrieved on 2013 August 15. ↑ News. EnterPLAY. Retrieved on 2013 August 15. ↑ My Little Pony - Who's ready to play?. Facebook (2013-08-04). Retrieved on 2013 August 15. ↑ Aug 6, 2013 9:31am. Facebook (2013-08-06). Retrieved on 2013 August 15. ↑ Timeline Photos. Facebook (2013-07-29). Retrieved on 2013 August 15. ↑ ~~~~Secret Derpy???. My Little Pony Trading Post (2012-08-25). Retrieved on 2012 August 29. ↑ Seven Seas Entertainment (2018-11-13). Brand-new license announcement! my little pony: the manga – a day in the life of equestria ✨and✨ my little pony: friendship is magic papercraft – the mane 6 & friends https://t.co/DwGlf8u4K4... https://t.co/Nc9K71PPz1. Retrieved on 2018 November 13. ↑ Seven Seas Entertainment to Release All-Ages MY LITTLE PONY Manga and Papercraft Book. Seven Seas Entertainment (2018-11-13). Retrieved on 2018 November 13. ↑ My Little Pony: Friendship is Magic Has Manga in the Works. Anime News Network (2013-03-27). Retrieved on 2013 March 27. ↑ Zelda's Akira Himekawa to Draw My Little Pony Manga. Anime News Network (2013-07-14). Retrieved on 2013 August 8. ↑ Exclusive: Official My Little Pony: FiM Inspirational Posters and Trolley for SDCC (2012-06-29). ↑ Party Cannon Use #63 (2012-05-10). ↑ My Little Pony Friendship is Magic Comic-Con Poster (2012-07-26). ↑ Official Map and Season 2 Cast Picture Show Up. Equestria Daily (2012-08-03). Retrieved on 2012 August 3. ↑ "Nayuki" discussing the creation of the villain poster, archived locally. ↑ 'My Little Pony': First Looks at New Books!. EW.com (2013-04-02). Retrieved on 2013 April 3. ↑ 'My Little Pony' books gallopping to shelves near you -- EXCLUSIVE. EW.com (2013-04-02). Retrieved on 2013 April 3. ↑ My Little Pony: The Elements of Harmony: The Friendship is Magic Official Handbook. Barnes & Noble.com. Retrieved on 2013 February 8. ↑ My Little Pony: The Elements of Harmony: The Friendship is Magic Official Guidebook. Amazon.com. Retrieved on 2013 February 8. ↑ Little, Brown Books Covers, Press Release, and Piles of Information. Equestria Daily (2012-11-20). Retrieved on 2013 February 8. ↑ My Little Pony: the Elements of Harmony: The Friendship Is Magic Official Handbook. Equestria Daily (2012-09-20). Retrieved on 2013 February 8. ↑ Megan McCarthy Tweet about Elements of Harmony Book (2013-04-11). Retrieved on 2013 May 28. ↑ My Little Pony: The Elements of Harmony. iTunes. Retrieved on 2014 January 14. ↑ My Little Pony: The Elements of Harmony: Friendship is Magic: The Official Guidebook [Kindle Edition]. Amazon.com. Retrieved on 2014 January 14. ↑ My Little Pony: The Elements of Harmony: Friendship is Magic: The Official Guidebook. Google Play. Retrieved on 2014 January 14. ↑ My Little Pony: The Elements of Harmony Vol. II. Hachette Book Group. Retrieved on 2016 November 28. ↑ 'My Little Pony' books galloping to shelves near you -- EXCLUSIVE. EW.com (2013-04-02). Retrieved on 2013 April 3. ↑ Fall 2013–Winter 2014 catalog. Little, Brown and Company (2013-03-13). Retrieved on 2013 April 26. ↑ Entertainment Weekly (2013-04). Retrieved on 2013 April 3. ↑ My Little Pony: Mini Pony Collector's Guide with Exclusive Figure. Retrieved on 2013 September 27. ↑ My Little Pony (EBook). Abrams. Retrieved on 2015 July 8. ↑ My Little Pony: The Elements of Harmony Vol. II. Amazon.com. Retrieved on 2017 June 6. ↑ The Ultimate Guide: All the Fun, Facts and Magic of My Little Pony. Amazon.co.uk. Retrieved on 2018 April 16. ↑ weatherhoof (2012-04-06). Review: German Audio Plays and DVDs. Derpy News. Retrieved on 2016 March 20. ↑ Daniel Ingram - The Missing Files - Las Pegasus Unicon 2013. YouTube (2013-03-22). Retrieved on 2013 November 8. ↑ Lambert, David (2011-11-07). My Little Pony: Friendship Is Magic - The Hub Network's New Series Comes to DVD from Shout! Factory. TV Shows on DVD. Retrieved on 2011 November 7. ↑ My Little Pony Monopoly Pre-Order ships July. ToyWiz.com. Retrieved on 2013 March 10. ↑ Kärnan My Little Pony Regnbågsspelet. Hiko.se. Retrieved on 2013 March 10. ↑ My Little Pony Trouble Board Game. DealsDirect.com.au. Retrieved on 2013 March 10. ↑ Sethisto (2016-03-19). OFFICIAL Pony Roleplaying Game on the Way from River Horse. Retrieved on 2016 March 20. ↑ MLP tissues (2012-12-23). Retrieved on 2012 December 24. ↑ ASM 2011 Toy Fair Basic Fun gallery (2011-02-15). Retrieved on 2012 October 14. ↑ What is friendship all about? My Little Pony X MIMOBOT = Friendship is magic! (2013-02-28). Retrieved on 2013 March 1. ↑ Ultra PRO post on Facebook (2013-03-26). Retrieved on 2013 March 27. ↑ Hasbro Plays Serious with World Trade Jewelers (2013-04-16). Retrieved on 2013 April 18. ↑ Josie Steenhart (2017-07-26). My Little Pony gets edgy NZ makeover with Deadly Ponies. Stuff.co.nz. Retrieved on 2017 October 19. ↑ My Little Pony Rainbow Dash Vinyl Figure. Retrieved on 2013 January 17. ↑ My Little Pony Bubbles Vinyl Figure. Retrieved on 2013 January 17. ↑ My Little Pony Fluttershy Variant Vinyl Figure Pre-Order. Retrieved on 2013 January 19. ↑ My Little Pony Dr. Whooves Variant Vinyl Figure Pre-Order. Retrieved on 2013 January 19. ↑ Facebook comment by Funko (2013-02-27). Retrieved on 2013 February 27. ↑ 67.0 67.1 Facebook message from Hot Topic (archived on Photobucket). Retrieved on 2013 March 17. ↑ Images of Funko Twilight and Trixie!. My Little Pony News (2014-01-21). Retrieved on 2014 July 21. ↑ Applejack and Big Macintosh Funko Prototypes. My Little Pony News (2014-03-19). Retrieved on 2014 July 21. ↑ Sethisto (2014-07-17). Funko Discord, Daring Do, and Rarity Hot Topic Website. Equestria Daily. Retrieved on 2014 July 21.